structures, which have poor attenuation of x-rays, are lower in density. CT scanning produces cross-sectional images of a patient rather than the conventional shadow images of conventional radiography. Figure I-23 schematically illustrates CT scanner operation. Confusing and distracting overlying structures are eliminated. In x-ray CT scanning, a fan x-ray beam from a source rotating about the patient passes through the patient, and the exit transmission intensity is monitored by a series of detectors. 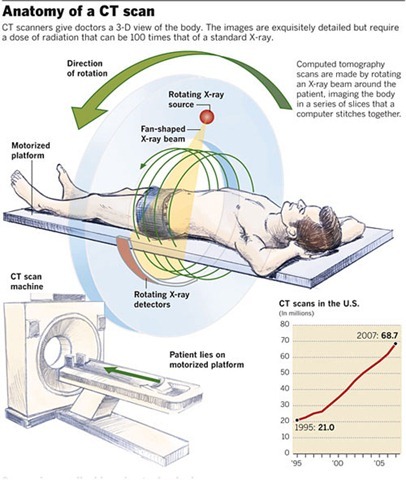 Spiral CT scanners move the patient through the x-ray beam while the tube continuously rotates around the patient. The x-ray beam “cuts a slice” about 10-mm thick through the patient. The transmission at any angle can be used to calculate the average attenuation coefficient along the length of the x-ray beam. By measurement of the transmission at many angles around the patient, a complex group of mathematical equations can be solved to calculate and determine the mass attenuation coefficient of small (about 1 × 1 × 10 mm) volume elements (voxels). The final cross-sectional image is then made up of a display of the gray scale value of every voxel. For historical reasons and convenience, the attenuation coefficients are reported in terms of Hounsfield units. In Hounsfield units, bone and other dense materials are +1,000, water is equal to 0, and air is equal to –1,000. CT scanning, like digital radiography, can separate spatial and contrast resolution. Three key advances enable CT data to be acquired continuously with on-going patient movement. These are slip-ring technology, precise patient table transport, and software reconstruction algorithms. Slip-ring technology was the fundamental step that allowed volume data acquisition and was necessary for subsequent developments described below. In older (conventional) CT systems, there was an inherent delay of 3–5 seconds between each exposure. This arose from the physical need to have cables connecting the stationary gantry and the rotating X-ray tube, detector systems, and controls (tube–detector assembly). After 1–3 exposures, depending on the cable length and other factors, the cables became wound and rotation of the tube–detector assembly had to stop, change direction, and then unwind while further exposures were taken. Not only did this result in interrupted data acquisition but occasionally led to mechanical problems. Slip-ring technology brought about a major change. It abolished the physical need for the presence of an electrical cable between the ‘on the ground’ generator and the moving tube–detector assembly. Instead, power from the generator is connected to a large stationary ring. Other large rings that house the X-ray tube, detector systems, and controls move around within the stationary ring. Power is transmitted between the stationary and moving rings by means of brushes. Hence the scene is set for continuous X-ray rotation (rather than back and forth) and continuous data acquisition. 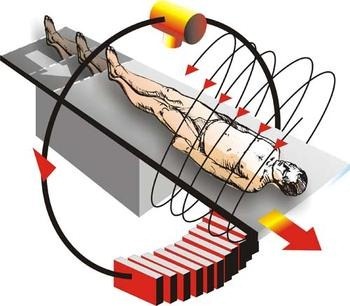 The detection of X-rays and gamma-rays depends on the interaction of their electromagnetic fields with matter. There are three forms of photon interaction with matter that are most important in nuclear medicine: photoelectric absorption, Compton scattering, and pair production. In a photoelectric interaction, an atom absorbs all the energy of the incident photon. The photon ceases to exist but the energy is transferred to an inner-shell electron which is ejected and is then referred to as a photoelectron. This creates a vacancy in an orbital shell which eventually leads to the emission of a characteristic X-ray ( Fig. 6.1A ). In a Compton interaction, a photon interacts with an orbital electron and loses some of its energy which is then transferred to the electron. The photon as a result is ‘scattered’ or deflected off in a new direction with a lower energy ( Fig. 6.1B ). In pair production, high-energy photons interact with the electric field of a nucleus ( Fig. 6.1C ); the photon transfers its energy to create a positron and an electron. Since each particle has the rest mass of an electron, 0.511 MeV, this requires a minimum photon energy of 2 × 0.511 = 1.022 MeV. Radionuclides with photons exceeding 1.02 MeV are not generally used in nuclear medicine. 2. ULTRASONOGRAPHY:-Ultrasound is generated by piezoelectric materials which have the property of changing thickness when a voltage is applied across them. Lead zirconate titanate (PZT) is the most widely used. The crystal is mounted in a conveniently shaped holder which contains the electrodes and any associated electronics, as well as the lenses and matching layers required to improve the beam shape (see later). The whole assembly is known as the probe or transducer, although strictly the latter term should be reserved for devices that change one form of energy into another, in this case electrical to acoustic energy. High-frequency ultrasound gives good resolution because of its short wavelength, but the rapid attenuation of high-frequency ultrasound by tissue is the limiting factor to the maximum frequency that can be used in any given clinical application. Frequencies as high as 20 MHz can be used when only a few millimetres of tissue are to be traversed, such as for imaging the eye and skin and for intravascular ultrasound (IVUS). For superficial tissues, such as the thyroid, breast and scrotum, 7–15 MHz is appropriate. For the heart, abdomen and second and third trimester obstetrics, 3–7 MHz is optimal, while for some difficult applications, such as the abdomen in obese subjects, and for transcranial studies (most of which use Doppler), one has to resort to 1.5 or 2.5 MHz transducers. This frequency limitation is being reduced by the use of coded transmit pulses, which essentially impose a signature on the pulse (for example, by making its frequency slide upwards during the pulse, so called chirp encoding) so that the receiver circuitry can detect true echoes even when they are weaker than the noise floor. Acoustic shadowing and increased through transmission of sound (often referred to as enhancement although this term is better reserved for the signal-augmenting effects of microbubble Contrast agents) are important components of the ultrasound image. Shadowing occurs when little or no ultrasound can penetrate an interface and results in a dark band over the deeper tissues, bounded by the ultrasound beam lines, which are parallel for a linear transducer and radiating for a sector transducer ( Fig. 3A.17 ). Absorption and reflection are the two main causes of shadowing. If a portion of the tissue being imaged absorbs ultrasound faster than the background, the chosen TGC(TIME-GAIN COMPENSATION) will be insufficient to compensate properly, and therefore tissues deeper to the highly attenuating region are undercorrected and appear darker than adjacent tissue. Fibrous tissue and, to a lesser extent, fat attenuate at a higher rate than the usual 1 dB MHz-1 cm-1 and are common causes of acoustic shadowing, for example in a fatty liver, behind scars and behind scirrhous breast carcinomas. High attenuation also partly accounts for the shadows seen deep to calcific lesions such as biliary and renal stones, but here intense reflection is also a factor. Whatever proportion of the incident ultrasound is reflected is not available to continue through for imaging. For stones this amounts to about 60% of the incident energy, but for tissue–gas interfaces almost all 100% of the incident ultrasound is reflected and these produce dense shadows. In this case, the shadows are often partially filled in by reverberant echoes, which form because of the efficiency of these gas–tissue boundaries as reflectors, so that reverberation artefacts commonly occur. The noise in gas shadows has given rise to their designation as ‘dirty shadows’ in stones, as compared to the ‘clean shadows’ behind stones, and this is sometimes a useful differential diagnostic feature. Whether a stone or gas bubble actually casts a shadow depends on its size relative to the ultrasound beam width. A significant fraction (about three quarters) of the beam must be obstructed to cause a shadow. If a stone is smaller than this, or lies away from the central axis of the beam, enough ultrasound passes beside it to insonate the deeper tissues. In practice, shadowing is usually apparent behind renal and biliary stones of 5 mm or more in diameter, and much smaller calcifications may also shadow if high-resolution transducers are used. Groups of fine calcifications can also shadow if their aggregate size and density is high enough; for example, in nephrocalcinosis. A third important type of shadowing, ‘edge shadows’, are sometimes known as ‘refractive shadows’, a description based on one explanation of their origin. They are seen as fine, dark lines extending deep to strongly curved surfaces and do not imply attenuation or strong reflections. Cysts and the fetal skull are typical examples and fascial sheaths are often also responsible, for example the fine shadows seen beyond Cooper’s ligaments in the breast and those caused by the neck of the gallbladder. These edge shadows must be recognized as being different from attenuating and reflective shadows to avoid errors in their interpretation. Some solid tissues also show increased sound transmission, however, usually because they have a high proportion of fluid. Many tumours fall into this category, especially fibroadenomas in the breast, and lymphomatous deposits and inflammatory masses may behave in the same way. Even those fluid cavities that contain echogenic material, such as suspended crystals in the gallbladder, pus, blood or necrotic tissue, usually still produce increased transmission, depending largely on the proportion of fluid present. The prime determinant of the strength of ultrasonic echoes is the impedance mismatch (Z) between adjacent tissue components. At the risk of being somewhat simplistic, in practical clinical terms this may be understood as interfaces between tissues of different densities. The larger the mismatch the stronger the echo, so that interfaces between soft tissues and bone, for example, give very strong echoes and, within soft tissues, the most significant components are fibrous tissue (often in the form of the perivascular microskeleton) and fatty tissue. Thus, while uniform regions of fibre or fat are echo-poor (subcutaneous fat and retroperitoneal fibrosis are examples), admixtures between them and watery tissues give stronger echoes. A second important factor is the concentration of the scatterers: for a given impedance mismatch, a region that contains a large number of scatterers is more echogenic than one where they are spread out. Commonly, the ‘dilution’ of scatterers is caused by an increase in water content. The low reflectivity of the congested liver in right heart failure is an example. Malignant tumours are a general case: until they grow large enough to undergo necrosis or calcification (which produce new reflectors) they tend to be echo-poor ( Fig. 3A.19 ). strong echoes are also obtained from the multiple interfaces of the vessel walls of haemangiomas, and even stronger ones from angiomyolipomas, in which there is also admixed fatty tissue. This entry was posted on July 25, 2010 at 10:43 am	and is filed under Uncategorized. You can follow any responses to this entry through the RSS 2.0 feed. You can leave a response, or trackback from your own site. Have found this site very useful,thanks. Well put together site,very informative. A very impressive blog,lots of useful information here. Great to see all this information put together. Great post,full of valuable information. This is a really useful and well put together article. This is a well researched article full of valuable information. Its such as you read my mind! You appear to grasp so much about this, like you wrote the guide in it or something. I feel that you could do with some p.c. to force the message home a little bit, however other than that, that is fantastic blog. A great read. I will definitely be back. So glad i found this site,it has been really helpful. I found some really useful information on this site,cant wait to share it. Really looking forward to your next article. Great and useful breakdown of information.